Oh jeez we spent almost 12 hours in Bukit Bintang yesterday! Phew! 5 hours were spent torturing my hair sitting in the salon to get my hair done and the rest of the time was spent Christmas shopping, eating and camwhoring. Even though this was my first time in the salon (can't remember the name though), I felt very welcome. It is a friendly salon at Sungei Wang Plaza, with all the good-looking and highly-skilled male hair stylists. I would definitely go back! Well, it's definitely not because of the good-looking hair stylists. After a consultation with Joe, he helped me figure out what works best for me. He knows exactly what cut and color would suit me. Best of all his prices are very reasonable and he's a joy to chat with. He took time to talk about my hair before doing anything to it and took his time while cutting it as well. I had my hair cut and straightened and dyed, plus a treatment! The result of 5 hours at the salon is enviably sleek and easy to maintain. I love my hair! It is ridiculously soft and silky. Now, I no longer look like a lion's mane when I wake up in the morning! Some women are happy to spend an hour on their hair in the morning. I want to only spend two minutes! There is a certain smell in the air, fa-la-la-la-la~ Christmas spirit arriving too soon? Are you ready for Christmas already? I like the new haircut! But 5 hours in the salon? Wow! Hi Monica, Loved the color! & it looks very well on you. Wah so nice la ur new silky soft lion mane sweetie!!! I can see the colour clearly, like dis la I like!! i definitely love straight hair.. that's why I had mine rebonded once too.. [now that my hair is thinning.. my late father was bald.. (but still handsome)..and I probably would go bald one day too]... it is quite straight for some reason.. lol! That’s why if I go for makeover, sure I will send B for massage or something so he can kill time in a fun relaxing way instead of angrily waiting for me hahaha, poor thing right if they have to wait for 5 hours!! I am in all honesty... envious. i so love your hair Monica! waahhh! I am crying inside to have that hair, too. I have not been to the salon since 2006. hmm.hopefully soon! have a pretty day pretty Monica! Yeah Bill… long story but YEAH hahahahahahhahahah! Recent blog:=- personality test: zoo.. Anyway, i have no idea how the bouncy, and silky feeling is. wow now thats some pretty hair! 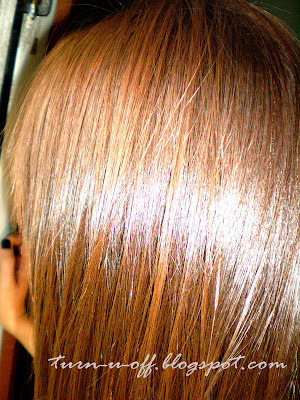 :D the last time i did my hair took two hours to dye and cut, and it was killing me already! lol. Marzie was distracted, for sure...lol. Hahahaha I WAS distracted Mize… I was playing my Farm Frenzy 3 hahahahahahaha!!!! Oh I forgot to change my handphone ringtone and callertunes to Christmas songs! Must do it now! haha! oh, tell me about it. LOL! Wah only RM280! That is cheap Mon.. very worthit!! haha yeah coz my hair is not THAT thick and long, LJ!! Ohh.. no wonder lah so economical.. good for you. And you look gorgeous! yalor I oso don't understand why affect MPG only! Yelah .. so irritating lah blogger! yeah certain accounts only...mine ok! Suddenly white page and everything is missing right LJ? Some more since last night, surely I cannot help but feel GALM…..
At least I haven mandi cause woke up at 5 LJ hahahahaha, go n mandi! yeah MPG suddenly white page!! lol yalor LJ didn't mandi the whole day hahahhah!! MPG crying now it seems Monica, so sad… some more kan, my post I wrote there is a SS PB…. What if they reject cause they cannot see it there??? More depresi now thinking abt poor MPG… takde hujan takde rebut, alih2 je blank page…WTF indeed…..
Hugsy Mariuca!!! oh dat one is SS PB?! aiyoo so how ah!! Some more 25 bucks u know dat one… dats why la heartpain now thinking abt it…. I hope they won reject…cause once they reject sure cannot resubmit huhuhuhuhuhuhuhuhuhuhuhu!!!! At least you got the offer.. I was asleep and missed it!! I think should be ok in a while dearie.. sat ah! Yeah 25 bucks. So of coz la kelam-kabut chop…cause u know la MPG never gets PBs…. Sure or not LJ…cause dis started since 2am like dat… lama tu…. I’m sure if they reject you can reason with them.. after all .. not your fault mah..
hey Maxi said she is able to open MPG!?? haha! will sure try to find a good salon first. it's too damn expensive here in Sweden. ahhhh! hmmm how much that would cost u Maxi? It’s ok now GP.. MPG is up!! Yeay!